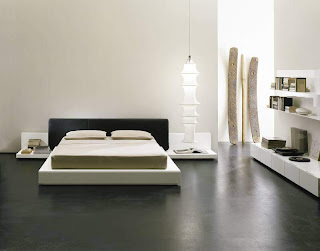 No doubt one of the most important space of our home is the bedroom, not only because it is complicit in our privacy, but because it is the place where we can spend time with ourselves, for this reason here are some ideas and suggestions to enjoy a Modern Bedroom Design. You need to understand that all the bedroom should be functional, this will depend on good account of the activities and the time you spend on it, the fact that form follows function is one of the most important features of modern designs. By understanding this first feature and according to it, you decide the type of accessories to be used, but basically the idea is to avoid clutter and exaggeration, modernity does not mean cramming the room, quite the contrary, must choose clean lines, not only for furniture, fittings must also comply with this condition. As for colors, background suggests using neutral tones, they must be offset by the bright colors and abstract designs of accessories. Remember that the most important is that you feel comfortable with the outcome. I love that low bed. It looks very modern. We just reinstalled new single beds in our home and I personally chose that style.